Geeks, You Just Gotta Love Us! So a few weeks ago I read something about a Donkey Kong movie coming out soon. Since Donkey Kong was MY game as kid I wanted to see if I could out more about the film. 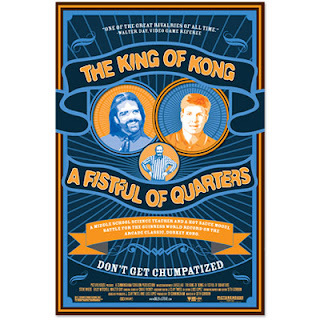 Turns out it is a film called The King of Kong: A Fistful of Quarters. The movie opened yesterday, but since I was still recovering from my colonoscopy I would have to wait a day. No biggie. So today I looked online and it is playing at the Lumiere in San Francisco. I bought my ticket for the 4:45 showing and headed out. What a geekfest! Now I have no problem calling myself a geek, but damn, some of the players in this film are 100% pure geek, lol. Billy Mitchell one of the two main players comes across as a grown man who doesn't to give up his only claim to fame, a world record high score set in 1982. He looks like king geek with his minion geeks hanging on his whims to do his bidding. All in the name of a Donkey Kong high score. Steve Wiebe, the challenger to Billy's crown, is the new guy in town trying to break through an empire that was built around Billy to protect his crown. An empire that by the end of the film I think was starting to see that maybe Billy does have a problem and that Steve is a legit and honest competitor. If you grew up in the golden age of video games in the arcades, or have interest in seeing what that golden age was like... go see this film. I loved it, it was funny, it brought back some great memories of playing Donkey Kong for hours after work when I was in high school. Colonoscopy, a word that sends fear into everyone. Fear not, the procedure itself was a breeze. Yesterday I went in for a colonoscopy. The procedure actually started the day before when I had to begin the preparation. This was the worst part of the procedure. Over the course of about 5 hours I had to drink a gallon of a liquid that cleans you out. They give you a flavor packet to add, but trust me it really didn't improve it much. The liquid was clear, just a bit thick, somewhat salty and tastes terrible. About an hour after the first glass the cleaning process began. Wow, it sure works good! Oh and I forgot, no food at all starting 24 hours before the procedure, only a clear diet. By Friday morning I was hungry and wanted to eat a poptart bad! I was scheduled to arrive at the clinic at 10:15am for a 10:45 appointment. Signed a couple forms when I arried, sat in the waiting for not even a minute when they called my name and it was time! Into a private room, changed into the hospital gown and got the rundown from the nurse about what was going to happen. She showed me the hardware, pretty cool looking actually. They have a high def monitor for watching everything. Basically a four foot long, black snake goes inside you. It's about the width of your thumb. They told me I could watch everything if I wanted. They also asked if I wanted photos... sure, why not! See photo! When the Dr. arrived they administered the drugs, basically some Valium and morphine. I remember the nurse asking if the drugs were working, I said how will I know, but my vision what a bit out of focus. Next thing I clearly remember was waking up in the recovery room. It was done. Damn, I missed it all. I have some faint memories of looking at the monitor, and maybe of a small bit of pain. But, I really don't remember anything of the actual 15 minute procedure. I spent the next hour in the recovery room sleeping it off. Lyndsey came to take me home as they wouldn't release me on my own. It was still a bit high, a bit bloated, but feeling fine and no real after effects. I am still trying to remember the procedure itself, but I think it is just a blank. So, if you need a colonoscopy do it. Don't worry, it is completely painless. Back in our day, we didn’t have any of yer fancy iPods and ringtones and downloads. We didn’t have the luxury and convenience of your scrotum-rings and your World Wide Web logs. When we wanted to steal the new Uriah Heep album, we couldn’t just troll the Internets for it, we had to do it the old-fashioned way — by hiking to the store (uphill, both ways) and shoving 12” of vinyl under our sweaters (which we had to knit ourselves). That’s why you sniveling whipper-snappers don’t appreciate the real value of music. Or Uriah Heep. Now get the hell off our lawn! I am sitting in the Ft. Lauderdale airport waiting for my 4:30pm flight home, going through Denver. It is HOT and HUMID here, 95 but feels more like 105. What an adventure this trip turned into. Everthing started last Thursday night catching 10:30pm red eye flight, going through Philly. I didn't book this trip myself because I sure wouldn't have gone through Philly. I arrived in Ft. Lauderdale around 12 noon on Friday. It was not the most direct route, I was probably in the air close to 8 hours. Landing in Ft. Lauderdale is when the adventure really begins, because US Airways didn't have my luggage, as well as the luggage of about 20 other people on the flight. There was plenty of time for the transfer in Philly, I guess one cart of luggage was just forgotten by the ground crew. Ok, it wasn't lost and was to arrive on the next flight in about 45 mins and they would then send it to my Hotel, The Westin Resort and Spa in Hollywood. Didn't happen quite like that. During the day I checked or tried to check multiple times on the status. The phone at the airport they gave me to call was never answered and the toll free number could only say they has no tracking details and the maybe it would show up. By 8pm with no luggage, getting very pissed at US Airways (your customer service is really BAD!) I decided to head to Walmart and buy some clothes. Remember is HOT and HUMID on the beach and I only have blue jeans and a long sleeve black shirt. Plus I had been in these clothes for 48 hours. I get some shorts, shirts and sandles and feel much better. Guess what, around 2am my luggage shows up. Better late than never. This turned into another wild business trip. The hotel was amazing, right on the beach. The event had the entire hotel so things were pretty loose. Pictures will be coming in the next couple days from the wet t-shirt contest and 4 hour boat ride. One activity from the trip that was the coolest was a half hour ride in a 47 foot high speed race boat. This boat has 3 1200HP engines and can hit 12oMPH. I stood in the left position next to the driver. Braced in very tightly and grabbing on even more tightly. We hit about 90MPH and flying over 6 foot rolling waves. We were moving so fast that I couldn't focus on the waves approaching. By time I saw one we were already past it, things were just flying by. Check out this live webcam of the hotel pool and beach, this is what my room overlooked. Now I have two hours to kill in the airport before my flight. At least this flight is much more direct and about half the flight time of coming out. I have not lived in Minnesota for 20 years, but in my heart Minnesota is still my home. Hearing the news last night about the 35W bridge collapse just astounded me, how could this even be possible. An entire major interstate bridge just collapses without warning. I have been on that bridge many times, why did it happen at this specific moment and not when I was on it? What about all the other bridges? Shortly after learning about this I had to drive over to Oakland, across the Bay Bridge. Of course parts of the Bay Bridge have already collapsed during the 89 earthquake and if another major quake hits it is expected to be disaster. Anyway, my thoughts and prayers go out to everyone in Minnesota. Visit www.redcrosstc.org and donate.